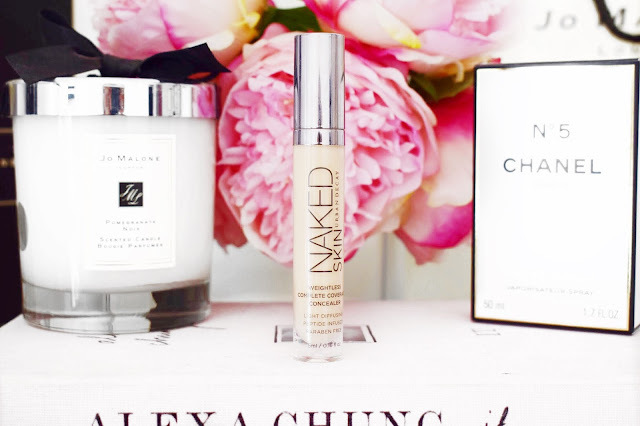 This post is going to be all about my new pride and joy and that is the new Urban Decay Naked Weightless Concealer. I say that this is new, but it has actually been out a couple of months, it is just new to me. Since I bought this foundation, I have fallen hard for it and I am completely in love with this stuff. I have so many different concealers in my drawer, but I find myself reaching for this one day in and day out. I was tempted into buying this Urban Decay concealer because so many different YouTubers and bloggers seemed to love it, so naturally I had to buy it and try it out for myself. First let me start with the packaging. This packaging is very nice. It is a thick plastic tube that almost feels like glass, but as it is plastic it makes it really good for travelling with. This is certainly one of the nicest looking concealers that I have got, it is definitely up there with the Nars Radiant Creamy Concealer in my eyes. Then for the applicator, this concealer has a doe foot applicator which is very flexible, so it moves to the contours of your face and that makes it really nice and comfortable to apply the product, especially underneath the eyes. I have been using this in all of the areas which I would normally use a concealer so under my eyes, centre of the forehead, down the bridge of the nose, cupid's bow, chin and a small amount on the brow bone. Then I will blend this all out using my damp Beauty Blender. If I am going for a look with minimal makeup I will just apply this directly under the eye from the wand and then I will blend it out using either a MAC 217 brush or a Morphe E20. This just leaves a really flawless and airbrushed look on the skin. Now, I want to mention the consistency of the product. I find that this is an incredibly creamy and easy to use product. As the name suggests, it has a very ‘weightless’ feel when it is applied to the skin and when it is blended out, it feels even more lightweight. I find that because of the stunning consistency of this concealer, it blends into the skin with no effort needed and that is why it looks so stunning on the skin. This is one of the main reasons why I have been reaching for it time and time again, because it feels like nothing on the skin and does the job perfectly. Now onto the most important thing and that is the level of coverage. In my opinion, this Urban Decay Naked Weightless Concealer is a medium level coverage concealer. I used to stay well clear of a medium coverage concealer, but I think that this one is stunning, and it looks beautiful on the skin. This hides all of the darkness underneath my eyes and if I do feel like some of the darkness is peaking through, I will go back in with just a touch more product and everything is completely hidden. I feel like for an everyday basis, this is just the most perfect concealer and I love reaching for it time and time again. There really is nothing else that I can say about this Urban Decay Naked Weightless Concealer to try and sell it to you guys. The consistency is beautiful, the applicator is perfect, and the coverage is ideal. I know that this is going to be a permanent item in my makeup collection for a very long time and I always look forward to using it. I will leave a link to this concealer down below in case you want to check it out for yourself. Make sure to leave me a comment and let me know if you have tried this foundation and let me know what you thought about it! I haven't actually thought about using my MAC 217 for blending concealer but that's a great idea! Need to try that! I still haven't tried this concealer but I really need to as everyone just loves it! I love it, it is a great brush for blending. Another great cheap one is the Morphe E20!